Updated 7/18: Read more background on this story here. This video is making the rounds this weekend. 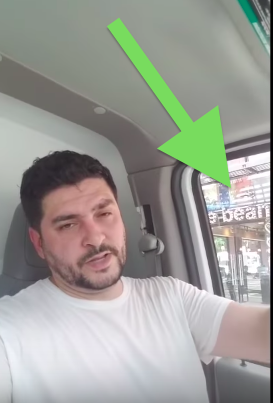 Martin Fernandez, a contractor working at a building only ID'd as being on the Lower East Side, documented the clean-up of a roach-filled apartment after the tenant was evicted. "When I first started doing work, we gave him a new stove and he was a very clean guy," he recalls about the tenant. The apartment is filled with rotting garbage, empty bottles and assorted junk. Cockroaches swarm across the the walls, floor and furniture. "The refrigerator caught on fire," Fernandez notes as he peers into the scorched interior of the appliance. It gets more grim as the crew discovers what happened to the tenant's cat. For further reading, the Times recently had a piece titled "Helping Those Who Hoard," which included photos from several East Village apartments. Fernandez posted a follow-up video titled "Rage over Fake News because of my Cockroach Infested apartment video." I had the misfortune of seeing a place like this in the EV. I went to cat-sit for a co-worker and knew something was bad when roaches were pouring out from under the front door before I even opened it. The situation was so vile, I made him take the cat to the vet and it had to have a lot of treatment because of the disgusting environment. The tenant then tried to make me pay the vet bill. He didn't see what the problem was at all living in filth. I've had to deal with several hoarders in the last few years, even helping a few clean apartments, and the problem is much bigger than I once thought. 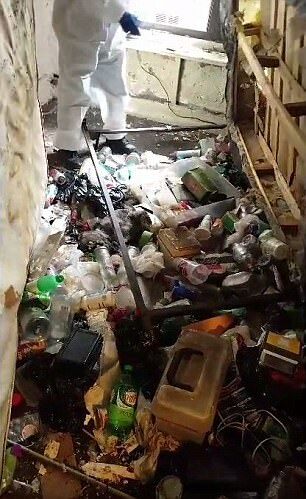 I've been able to identify at least 1000 apartments occupied by orders, but it's a hard problem to deal with until the people occupying the apartment to become unable to care for themselves.Somewhere between 2%-5% is the estimated percentage of hoarders in the population. My bet is that New York is at the higher end of that range because we have so many single people living in smaller apartments, and people here are just more neurotic in general. Hoarding tends to be associated with people who have OCD or obsessive compulsive disorders and anxiety disorders. Let's assume that 5% of New Yorkers are hoarders. There are 850,000 apartments in Manhattan. That means over 40,000 apartments are occupied by hoarders. Based on the EV population we probably have about 1500 in the East Village alone. You would never even suspect there's a problem until you see one of these places for yourself. It's sad that people live this way but the families and the city really need to do something to help these people. It's a terrible way to live. Somewhere people just break down, lock the door, close the windows, tune out. There was a good series on TV a few years ago, what all these poor people had in common was some sort of emotional trauma in their lives, the hoarding followed. I had a friend who saved the New York Times for 10 years. He broke his leg one summer and the first time I ever visited his apartment was to give him some help. He had a large 2 bedroom pre-war building but was living in the tiny second bedroom. The apartment was clean but to reach his kitchen of the other rooms you had to walk through a waste high valley of neatly stacked newspapers and magazine. I nice clever man and you would not superset such irrational behavior from him but that was his reality. Eventually his father came from the mid-west and helped him move all the printed material to the curb. I heard the next day he started saving newspapers again, he finally moved to his family home and I lost all contact with him. Shame. Looks like it could be a nice apartment too. Points for the equality sticker at least. Not a hoarding situation but I have a vague memory from around 2001 or so of reading about a high-rise apt in midtown where the elderly tenant had passed away; when the super and maintenance staff entered they were shocked to discover basically a time capsule from the mid-50s. Barely a thing modern except the groceries in the pantry. It was pretty fascinating. I'll try to find a link. I don't think the super should have recorded and posted a video of the aftermath of what was clearly an unfortunate situation. What good can we take from this video? How can we use that video to help other people? I'll have more background on this tomorrow. filth 435 East 63 St. Garbage of interest to me was the armchair filled with feces. Stewart and Cyril Marcus, not hoarders at least, just slobs. Golden State Warriors, come out to play! What's happening with the former Edge space?